These turnours arise in the pancreas from APUD (amine precursor uptake and decarboxylation) cells and are sometimes called apudomas. Pancreatic endocrine tumours can occur in association with other endocrine turnours, particularly parathyroid adenoma and pituitary adenoma, as part of multiple endocrine neoplasias. Endocrine turnours predominantly secrete one hormone that produces its clinical effect, but other hormones are often synthesized and can be detected either in the blood or in the resected tumour. These turnours mainly arise from G cells in the pancreas and secrete large amounts of gastrin. This stimulates maximal gastric acid secretion, so that the main clinical problem is peptic ulceration. Peptic ulcers occur in the usual areas of the stomach and duodenum and also in the jejunum. The ulcers are often large and deep and sometimes multiple. Haemorrhage and perforation can occur. Diarrhoea due to the low pH in the upper intestine is also a common feature. Jejunal mucosal abnormalities are also seen. A high serum gastrin confirms the diagnosis. Acid studies show high acid output. Treatment is with omeprazole (which inhibits the H+-K+ proton pump necessary for acid secretion). Octreotide is also used. Surgery is reserved for removal of the primary tumour only. The tumour may be demonstrated by scans or local venous sampling for gastrin. These tumours are malignant and although they grow slowly the patients now die of malignancy rather than gastrointestinal problems if the primary cannot be removed. ISLET CELL TUMOURS. These are described. VIPOMAS. These rare pancreatic tumours produce severe intestinal secretion and watery diarrhoea leading to dehydration. VIP is a neurotransmitter that stimulates adenyl cyclase to produce intestinal secretion. Plasma concentrations of VIP are very high and are diagnostic. Levels of PP hormone are also raised. The role of peptide histidine isoleucine (PHI), levels of which are also raised in this condition, is uncertain but this hormone may be involved in secretion. Corticosteroids help reduce the stool volume but octreotide is the most effective agent. An attempt should be made to localize the tumour and, if possible, it should be resected. GLUCAGONOMAS. These are a-cell turn ours of the pancreas that produce pancreatic glucagon. The patients have diabetes mellitus and a unique characteristic necrolytic migratory erythematous rash. The diagnosis is made by measuring pancreatic glucagon in the serum. A tumour originating in the right kidney has been described that produces marked hypertrophy of the villi in the jejunum and produces enteroglucagon (enteroglucagonoma). SOMATOSTATINOMAS. These have also been described; they produce diabetes, steatorrhoea and weight loss. 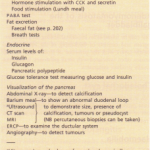 Go VL, Dimagno EP, Gardner J, Lebenthal E, Reber HA & Scheele GA (1993) The Pancreas, Biology, Pathology and Disease, 2nd edn. New York: Raven Press. Millward-Sadler GH, Wright R & Arthur MJP (1993) Wright’s Liver and Biliary Disease, 3rd edn, Volumes I and II. London: WB Saunders. 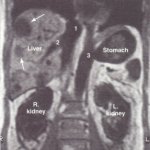 Sherlock S & Dooley J (1993) Diseases of the Liver and Biliary System, 9th edn. Oxford: Blackwell Scientific Publications. 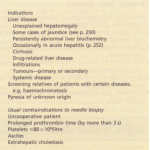 Sieisenger MH & Fordtran JS (1993) Gastrointestinal Disease, 5th edn. Philadelphia: WB Saunders. New England Journal of Medicine progress reports and current concepts, e.g. Runyon BA (1993) Current concepts. Care of patients with ascites. New England Journal of Medicine 330 (5), 337-342. Baillieres Clinical Gastroenterology series, e.g. 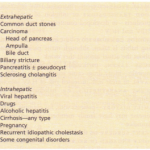 Sackmann M (ed) (1992) Diagnosis and Management of Biliary Stones. London: Bailliere Tindall. Current Opinions in Gastroenterology- useful updates with extensive references. Major journals such as Gastroenterology, Gut and Hepatology- monthly reviews and progress reports of current topics.